As the official death toll was raised to 21, officials gave revealed that sea sand and low grade cement was used in the construction of the eight-storey Istanbul building that collapsed earlier this week. Officials say 43 people were registered to be living there and they gave yet to account for the remaining eight. It is also not known how many visitors were in the building at the time of its collapse in Istanbul’s Kartal suburb on the Asian side of the city. 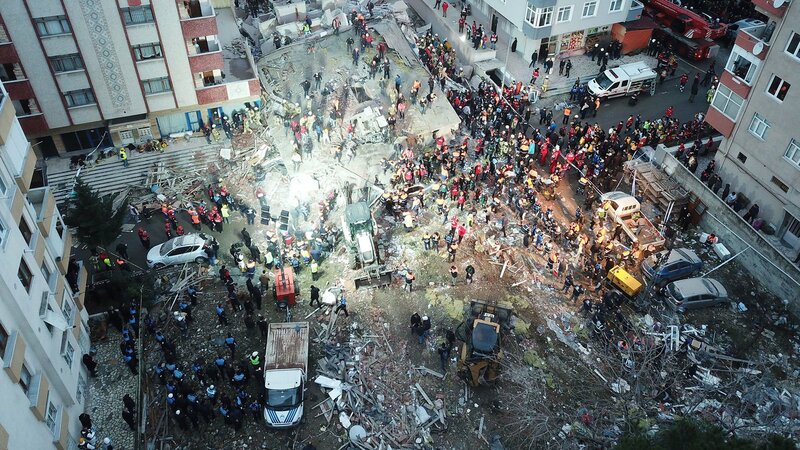 Istanbul’s chief prosecutor’s office said it has launched an investigation into the collapse of the 27-year-old building. Murat Kurum, the Minister for Environment and Urban planning, asserted that the only six floors of the building were legally permitted and the top two floors had been constructed against the regulations. According to Kurum low-quality concrete and sea sand was detected in the construction material, resulting in erosion and rusting in the steel reinforcing used in the building. Government legalising illegal construction for money? The Union of Chambers of Turkish Engineers and Architects, TMMOB, alleged on Thursday that the collapsed structure was legalised with due regulation in May 2018. The regulation, called ‘zoning amnesty’, had legalised the building in exchange for a proportional fee according to TMMOB. “Ministry of Environment and Urban Planning gave registration documents to unlicensed constructions via zoning amnesty. They claimed, with a money-indexed system, that the buildings were solid. Buildings lacking safety regulations against earthquakes that should have been demolished were legalised through this zoning amnesty Act. As a result, people have paid with their lives,” Esin Koymen, chair of TMMOB lamented on Thursday. The same day saw the funeral of the nine people from the same family who were retrieved dead during rescue efforts. Turkey’s President Recep Tayyip Erdogan attended the funeral along with the state protocol and giving a short speech to the gathered mourners. In a report published by the Chamber of Civil Engineers, IMO, in August 2018, it stated that 13 of 20 million buildings in Turkey, and half of the two million buildings in Istanbul, are illegal. “The time and fashion of the imminent collapse of structures in which we dwell are unclear. How the buildings will hold up in an earthquake is a complete mystery,” read the report of the chamber, pointing out the unsafe living conditions that most Turkish citizens have to bear.